When the two most prominent names in the Tech head coaching search were San Diego Chargers offensive coordinator Ken Whisenhunt and Temple head coach Geoff Collins, fans everywhere wondered who would be chosen as the future leader of Tech football. On one hand, there was a proven, experienced former Tech football player who seemed like the predestined choice in the decision. The story made sense for Whisenhunt: the Jackets, looking to redefine themselves as a pro-friendly team, would naturally want to hire a professional coach to lead that transition. However, Tech chose to go another route in their decision, hiring someone a full decade younger with obvious vigor and charisma. Geoff Collins owns a helicopter. At Temple, he appointed a staff member to the position of S.W.A.G. coordinator. This hire marks a steep departure from Paul Johnson, a brilliant on-field tactician who openly scorned recruiting rankings and cultivated an old-school image. It also continues a path that Tech set last year, leaving Russell Athletic for Adidas. These moves come after years of trouble convincing talented high school players to come to Tech. With new personnel, attire and team culture, there is real hope for Tech on the recruiting trail, even in a highly competitive landscape. Being in a major city presents an advantage in a school’s recruiting. The question is whether Tech can channel its advantage like USC or Miami have. Both schools have been known to use their inner-city locations as an attraction to athletes in years past. Atlanta’s influence on pop culture could help propel Tech in the hearts and minds of recruits, if properly harnessed. While Atlanta is known for its music and culture, that doesn’t necessarily carry over to Tech, leaving work to be done for Collins. This is where the advantage of the charismatic personality found in Geoff Collins will help pave the way for better recruiting. While having frustrated opponents for years, the triple option has long been a weak link when trying to pull in elite athletes. A new offense will help Tech get superior recruits, healing a reputation that drove pocket passing quarterbacks away. A more balanced offense will make the school more appealing towards receivers as well, a necessity in the modern high-powered offense era of college football. If successful, next year’s new-look offense will go a long way towards improving Tech’s standing in the minds of young athletes. Although the changes in the structure of the offense may be the most notable, Collins is a known defensive specialist. Famous for his attention to detail, Collins has coached under the likes of Nick Saban and Jim McElwain. While an improvement in defense may not create as a fast of a change in prestige as the complete overhaul of an archaic offense, in time it will increase the standing of Tech. It is simple: a better reputation means better athletes. If Collins can get Tech to be known for its defense then look for better recruits over the next few years. Assuming that the offense, defense and team culture improve, the question remains: how will academic rigor factor into recruiting? When posed this question, Coach Collins has expressed optimism, stating that Tech can be the place where academics matter. While true, it would be logical to assume that the school will miss out on recruits who exceed on the field but struggle in the classroom. These missed opportunities will hurt Tech, but what can separate them from other schools in the recruitment of highly talented, academically-inclined athletes is the value of the Tech degree, the same way talented athletes choose rigorous schools like Stanford. The hopes of Tech’s recruiting depend on Geoff Collins. While living in a large city and attending a prestigious school help, at the end of the day it comes down to his skill at the coaching position. If he can use his charisma, wits and energy to bring in better recruits, then the future of Tech football looks bright. Two early signs that Collins is succeeding have come to light in the past few weeks. First, four-star running back recruit Jamious Griffin, who was committed to NC State, declined to sign during the early period and then de-committed. Griffin visited Tech in December, and all six of 247Sports’ recruiting ‘insiders’ have predicted that he will bring his talents to Atlanta. In Johnson’s tenure, Tech’s runners tended to be players undervalued by conventional systems — his B-backs were essentially fullbacks, a dying breed in the sport, and his A-backs were undersized for a role that would scheme them consistent touches. Griffin brings at least the pomp and circumstance of a new caliber of running back recruit. The second sign of hope comes in the form of a tweet: a single bee emoji posted by University of Miami wide receiver Marquez Ezzard shortly after his visit to Tech. Ezzard, like a number of Miami players, announced his transfer after Mark Richt’s retirement. Ezzard played only two games as a freshman for the Hurricanes, which, under relatively new rules, means he can still claim redshirt status and not lose a year of eligibility. A four-star recruit just a year ago from Stockbridge, Ga., Ezzard was not recruited by Tech out of high school — though Kirby Smart and company gave him a scholarship offer — but Tech seems to be at least a serious contender a year later. Neither signing is official; both are potent rumors that have yet to materialize. But if they are true, even a brief look at the two players’ highlight film indicates that they are special talent. At multiple points, Griffin casually reverses field midway through a run as eleven hapless defenders scramble. Ezzard slips through defenses on screen passes and outruns would-be tacklers. Things obviously get more difficult at the next level, but both have received widespread recruiting attention for good reason. 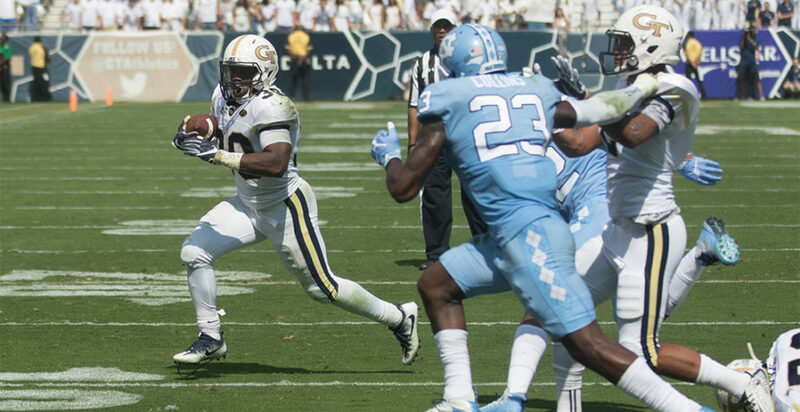 Perhaps Griffin and Ezzard work out, Griffin becoming a perennial 1000-yard rusher and Ezzard the first Tech wide receiver to garner significant pro interest since DeAndre Smelter and Darren Waller. Perhaps neither lives up to the expectations that will no doubt be set by the intelligentsia of fan message boards. And perhaps neither ever dons the white and gold. But if their interest in Tech, and Tech’s interest in them, is real, then schools that have made their living recruiting the South may notice a shift in the power balance, however gradual. The Jackets are here to play.